Recognising the huge burden of neurological and psychiatric disorders and prompted by the potentials of new techniques of molecular biology, biotechnology, genetics and imaging to study these, the 1990s were declared the 'decade of the brain'. This stimulated global scientific efforts to understand the human brain in health and disease. This review summarises some of the major research achievements during the decade. 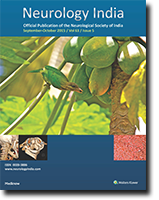 While it is impossible to provide a comprehensive summary of the voluminous data that has been generated, it was decided to provide a bird's eye view of the recent advances in the fields of developmental neurobiology, neurogenetics, neurochemistry and imaging of the brain, which have direct relevance for the clinicians. With increasing technological and surgical sophistication in cranial base and craniofacial surgery, reconstructive efforts are challenged to provide a reliable means of compartmentalisation. 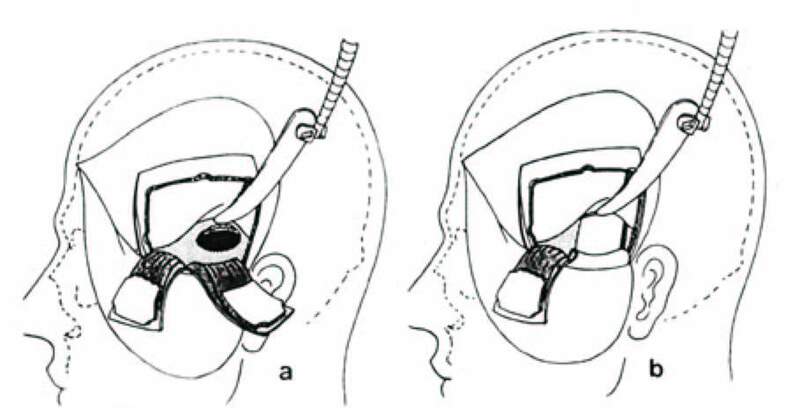 Some improvised methods of basal reconstruction with vascularised pedicle flap are described in this presentation. The dependable blood supply, long length, ease of harvesting and the ability to alter the arc of rotation of the described flaps make them versatile for lining skull base. The flaps may be used to cover defects, may be folded for bulk and may be used to carry blood supply to poorly vascularised recipient sites. The techniques are presented. The success of a perfect ward round lies in the role of the consultant leading the 'round making group' (RMG) as well as the hallmark of effective questioning and participation of each member. Twelve senior consultants with more than 10 years' experience in neurosurgical practice at three different university hospitals were observed during round making by a participant observer. Observations were made on the group climate of the RMG, the leadership pattern and language expressed by the clinician conducting the round and the effectiveness in his performance as a leader during clinical discussions. The group climate showed evidence of good productivity and flexibility with 92% and 75% consultants, pleasantness of climate was above average with only 50% (6/12) and poor objectivity with 42% (5/12) consultants. Forty two percent of the consultants were not always very well comprehensible, while only 50% (6/12) spoke exactly fitting the occasion. Only 33% (4/12) of the consultants used humour effectively, while 42% (5/12) spoke unnecessarily in between discussion and were poor in introducing the problems of patient to the round making group. Ward round making in neurosurgical practice needs a holistic approach with motivation, planning, leadership skills and structured curriculum to fulfill its objectives. Role of propranolol and cyproheptadine in the prophylaxis of migraine was studied in a controlled double blind trial. Two hundred fifty-nine patients were divided into four groups. Each group was either given a placebo, cyproheptadine, propranolol or a combination of the latter two drugs. The patients were followed for a period of three months. Significant relief in frequency, duration and severity from migranous attacks was seen in all drug treated groups over placebo. Significant correlation in response was seen in frequency, duration and severity in all the groups which received drugs. Statistically more significant relief was seen in cyproheptadine and propranolol treated group as compared to individual drug treated groups. In cyproheptadine and propranolol treated groups, the dropout rate was lower and associated symptoms were better relieved than in other groups. The study shows efficacy of combination of cyproheptadine and propranolol in migraine prophylaxis. Acidosis is a major contributing factor towards spread of the ischaemic focus in the brain. Drugs that increase pyruvate dehydrogenase activity could decrease the formation of lactic acidosis. The sodium salt of dichloracetic acid (DCA) has been found to be effective in reducing lactate. This study was undertaken to study the efficacy of DCA in reducing infarct size in experimental focal ischaemia in monkeys. Macaca radiata monkeys in the treatment group were given 35 mg per kilogram of dichloracetate intravenously immediately before occluding and interrupting the middle cerebral artery, and the control group was given saline as placebo under similar conditions. Mean infarct size expressed as a percentage of the size of the hemisphere in all the three brain slices was 35.38 in the control group as against l2.06 in the treated group (p=0. 0008). Catabolism of tryptophan and tyrosine in relation to the isoprenoid pathway was studied in neurological and psychiatric disorders. The concentration of trytophan, quinolinic acid, kynurenic acid, serotonin and 5-hydroxyindoleacetic acid was found to be higher in the plasma of patients with all these disorders; while that of tyrosine, dopamine, epinephrine and norepinephrine was lower. There was increase in free fatty acids and decrease in albumin (factors modulating tryptophan transport) in the plasma of these patients. Concentration of digoxin, a modulator of amino acid transport, and the activity of HMG CoA reductase, which synthesizes digoxin, were higher in these patients; while RBC membrane Na+-K+ ATPase activity showed a decrease. Concentration of plasma ubiquinone (part of which is synthesised from tyrosine) and magnesium was also lower in these patients. No morphine could be detected in the plasma of these patients except in MS. On the other hand, strychnine and nicotine were detectable. These results indicate hypercatabolism of tryptophan and hypocatabolism of tyrosine in these disorders, which could be a consequence of the modulating effect of hypothalamic digoxin on amino acid transport. Changes in cognitive function are an integral part of the clinical presentation of Parkinson's Disease (PD). P300 potential studies in early stages of Parkinson's disease are lacking and effect of L-dopa therapy on these potentials is controversial. In this study, changes in P300 potentials in early stages of PD and effects of dopaminergic therapy were investigated. P300 waves were elicited by standard auditory 'odd ball' paradigm and were recorded before the start of therapy and 15 days, 3 and 6 months after the start of L-dopa therapy in 25 newly diagnosed patients with idiopathic PD. All patients were classified according to Hoehn and Yahr scale. Minimental status examination (MMSE) was done in all. Control group had 20 normal subjects. The P300 latency was not significantly increased in early Parkinson's disease. This latency was reduced with dopaminergic therapy on 15th day, but increased later. Implications of the data are discussed. Spinal cord injury occurring without concomitant radiologically demonstrable trauma to the skeletal elements of the spinal canal rim, or compromise of the spinal canal rim without fracture, is a rare event. Though documented in children, the injury is not very well reported in adults. We present seventeen adult patients with spinal cord injury without accompanying fracture of the spinal canal rim, or vertebral dislocation, seen over seven years. None had preexisting spinal canal stenosis or cervical spondylosis. Following trauma, these patients had weakness of all four limbs. They were evaluated by MRI (CT scan in one patient), which showed hypo / isointense lesion in the cord on T1 weighted images, and hyperintensity on T2 weighted images, suggesting cord contusion or oedema. MRI was normal in two patients. With conservative management, fifteen patients showed neurological improvement, one remained quadriplegic and one died. With increasing use of MRI in the evaluation of traumatic myelopathy, such injuries will be diagnosed more often. The mechanism of injury is probably acute stretching of the cord as in flexion and torsional strain. Management is essentially conservative and prognosis is better than that seen in patients with fracture or dislocation of cervical spine. Cervical expansive laminoplasty has been advocated as an alternative procedure to laminectomy for the decompression of the cervical spine. It provides favourable cord decompression and stabilisation of the cervical spine and is a simpler and safer alternative to anterior fusion and laminectomy for myelopathy and myeloradiculopathy, due to multisegmental cervical spondylosis and ossified posterior longitudinal ligament. We report our experience in 24 patients with this procedure, 12 of whom had myelopathy and another 12 had myeloradiculopathy. The earliest symptom to improve was radicular pain or paraesthesia (75%). A reduction in spasticity was seen in 21 of the 24 patients (87.5%). Eleven patients had improvement in their motor power during a follow up period ranging from 1 month to 14 months. One patient deteriorated following the procedure and developed Brown Sequard features due to under riding of the lamina on the hinged side, another had severe post operative paraesthesias, while one patient had a CT scan evidence of 'closing of the door', without being symptomatic for it. 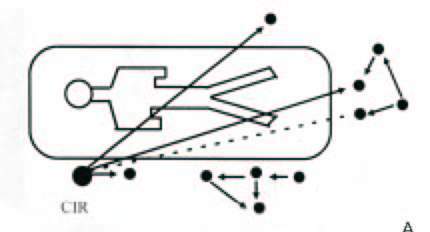 The technique of the procedure is discussed and the pertinent literature reviewed. 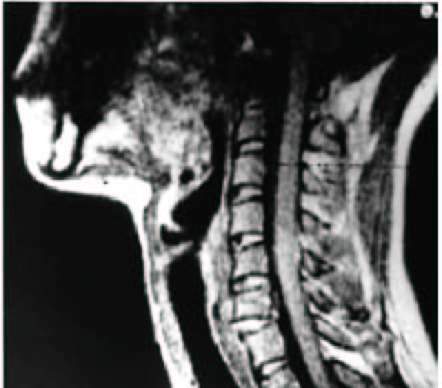 Vertebro basilar insufficiency (VBI) is a well known cause of vertigo. Brain Single Photon Emission Computed Tomography (SPECT) is an important diagnostic tool to detect and to quantitate the perfusion abnormalities in different areas of the brain. 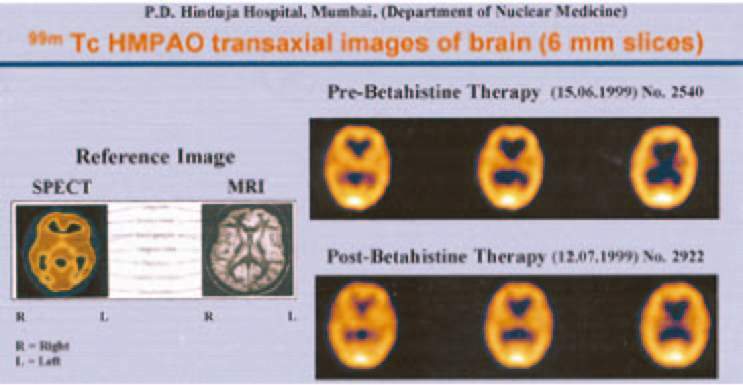 Effect of an antivertigo drug Betahistine on improving the hypoperfusion in different areas of the brain in vertigo patients was studied using brain SPECT. Betahistine at a dose of 16 mg three times daily was shown to improve perfusion in the hypoperfused areas of the brain resulting in relief from symptoms of vertigo. The cerebellar region, which is the most important area involved in vertigo patients with vascular pathology, showed almost complete normalisation of perfusion following Betahistine therapy. 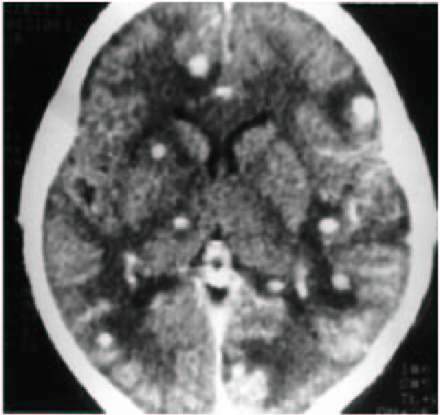 A clinical picture consisting of seizures, multiple non-tender subcutaneous nodules, and multiple 'nodular or ring' enhancing lesions in computed tomography of the brain is considered characteristic of neurocysticercosis in an endemic area. 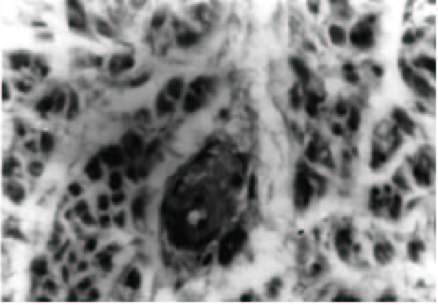 1,2 A case with a similar clinical picture, in whom serological tests and histopathological examination of subcutaneous nodule established tuberculosis as a cause, is presented. 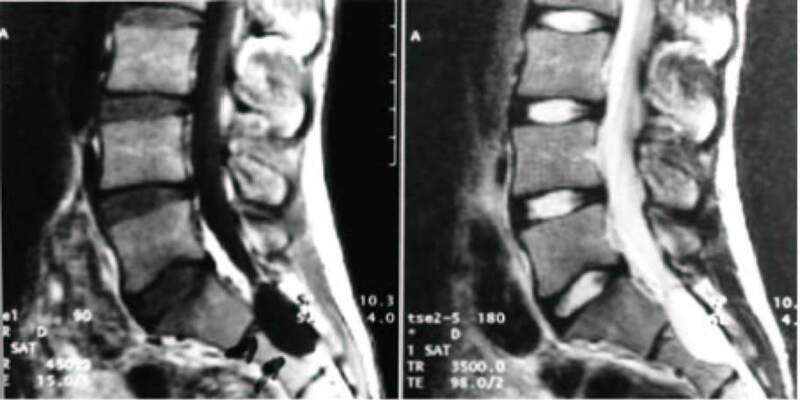 A 53 years old male, a known case of ankylosing spondylitis having recurrent attacks of hypoglycaemia, developed symmetrical distal sensorimotor neuropathy. The neuropathy was axonal with secondary demyelination. Evidence of vasculopathy was also noted on histopathology of the nerve. Serum C-peptide level was low, a feature reported with autoimmune hypoglycaemia with antireceptor antibodies. The patient showed spontaneous recovery. 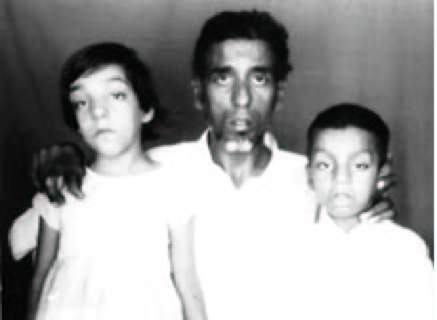 The term 'congenital myasthenic syndrome' (CMS) encompasses a number of heterogeneous disorders characterised by myasthenic symptoms since birth, usually with positive family history and absence of acetyl choline receptor antibodies. Recent advances in electrophysiology and ultrastructural analysis of neuromuscular junction have made it possible to identify the various defects underlying these disorders. We report four cases of CMS, with a review of literature. 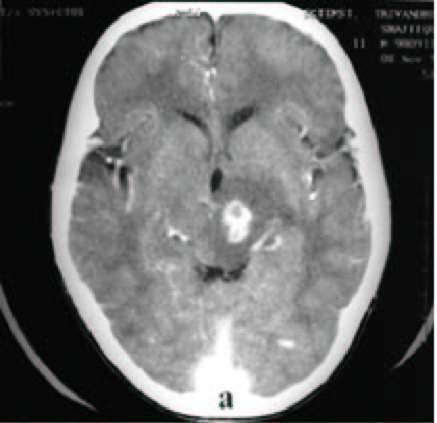 Medically treated brainstem abscess in a 11 year old boy with tetralogy of Fallot is reported. There was a complete resolution of the lesion without any neurologic sequelae during parenteral antibiotic therapy with crystalline penicillin, chloramphenicol and metronidazole. The pathogenesis and management of cardiogenic brain abscesses in general and brainstem abscess in particular has been reviewed. 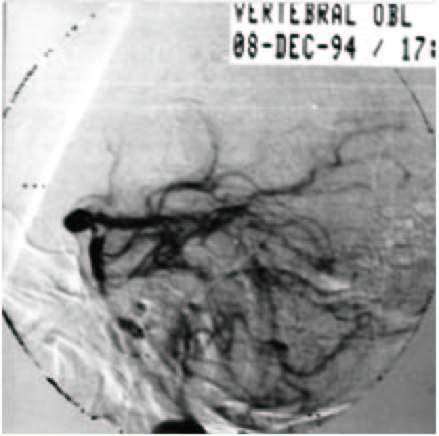 Mycotic aneurysms on the branches of vertebro basilar artery are rare. 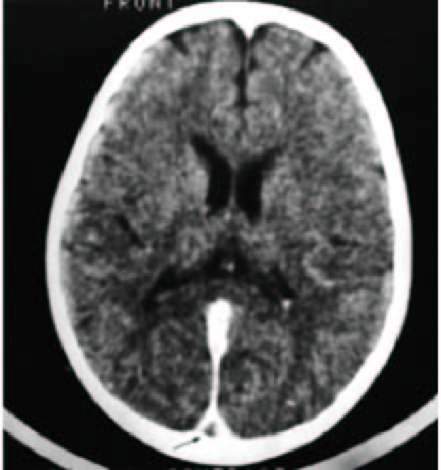 A patient of infective endocarditis with mycotic aneurysm on the posterior cerebral artery is described. 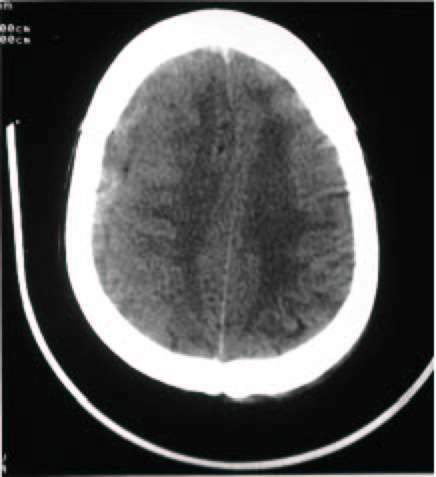 The aneurysm resolved with medical therapy. Controversies regarding the management of mycotic aneurysms are discussed. A nineteen year old man with intrasacral meningocele is reported, who presented with long standing episodic gluteal pain and progressive muscle wasting. 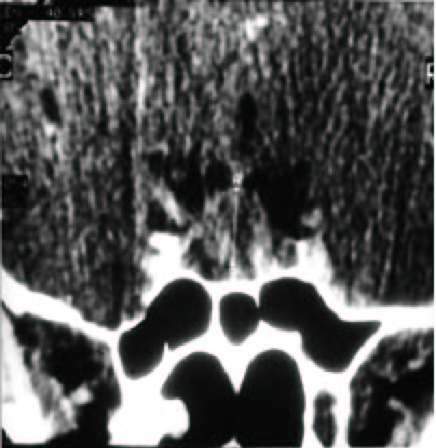 Magnetic resonance imaging established the diagnosis. Surgical excision relieved the pain but muscle wasting persisted. Pertinent literature is reviewed. Focal myositis is a rare idiopathic form of inflammatory myositis involving a single muscle. 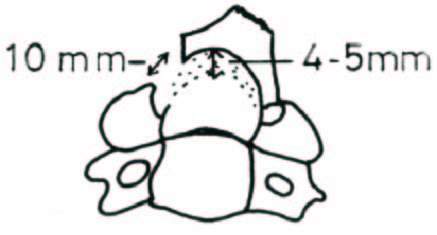 The presentation is often as a soft tissue pseudotumour. Magnetic resonance imaging (MRI) is a useful noninvasive imaging modality to demonstrate focal nature of the lesion. We describe three patients presenting as pseudotumour of the lower leg. MRI showed hyperintense signals in the involved muscle. 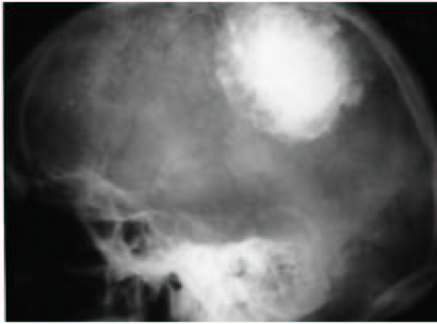 A totally calcified mid third falcine meningioma in an elderly male patient is presented. An uneventful enmasse excision was performed. Advantages of positioning on ipsilateral side for paramedian extracerebral lesions are highlighted. MRI findings of D12 fracture were suspicious of a pathological fracture. However, biopsy did not show any evidence of tumour. This resulted in the patient following up after one and half years with an epidural mass lesion and neurological deterioration. This paper highlights some of the MRI features of fractures associated with underlying pathology over traumatic or osteoporotic fracture. 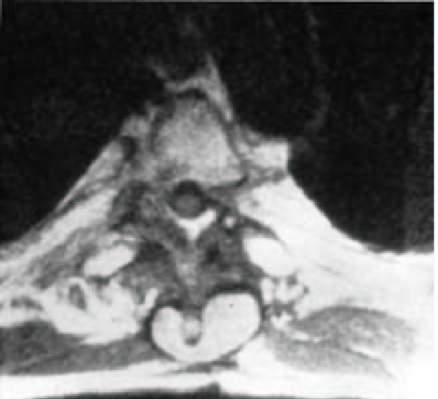 Histopathologically and immunologically confirmed case of paraganglioma of cauda equina region is described. 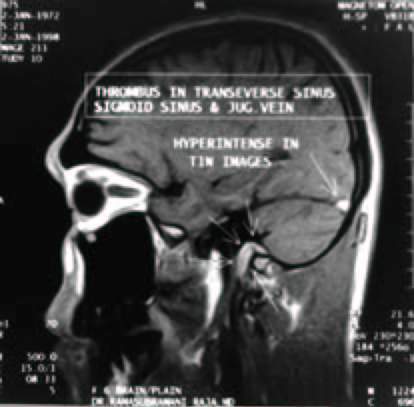 Cortical sinovenous thrombosis in a child with nephrotic syndrome and iron deficiency anaemia is described. The most probable mechanism for the hypercoagulable state was thrombocytosis associated with iron deficiency anaemia. The other possible contributing factor might have been the diuretic therapy during the phase of relapse. A rare case of non-functioning pituitary adenoma, which completely resolved following an apoplectic event without producing hypopituitarism, is described.